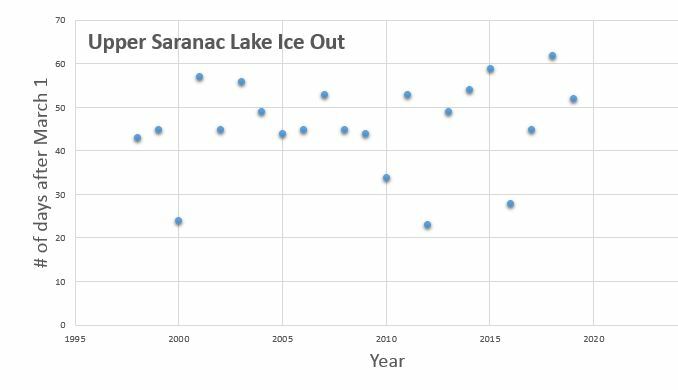 Known ice-out records have been monitored for Upper Saranac Lake since 1998. Since 2012, the Upper Saranac Foundation has taken up the maintenance of these records and has added ice-in and ice duration statistics. These records help in our ongoing work to study and understand changes occurring to Upper Saranac Lake. Ice-Out is defined as when you can boat to the deepest part of the lake from some shore point. The earliest ice out recorded was on March 24, 2012 and latest in 2018 on May 2nd. Ice-in is defined as when the ice prevents someone from boating to the deepest part of the lake from all the points on shore. While USL’s ice duration records are very limited, nearby lakes such as Mirror Lake have records dating back as far as 1903. Their records indicate a significant reduction in the duration of ice cover over time, with current ice cover on average 26 days shorter than it was in 1903. Mirror Lakes mean duration of ice cover over the entire record is 139 days. The mean duration since 2000 is 122 days. Research has shown that warming water temperatures and prolonged stratification are a threat to Lake Trout across their native range. The changes observed in the local ice record data reflect similar changes observed across North America. These changes represent a potential change in the habitat suitability for cold water fish, such as Lake Trout. Ice records from 1998-2011 were provided by Jim Dalhiem. From 2012 to present, records were recorded by the Upper Saranac Foundation Lake Manager.